Reliability on a Budget. The Inspiron Mini 1018 is the new 10-inch "budget netbook" from Dell. The hardware is up to current standards, but you'll have to go without additional features at a starting price of 279 Euro. 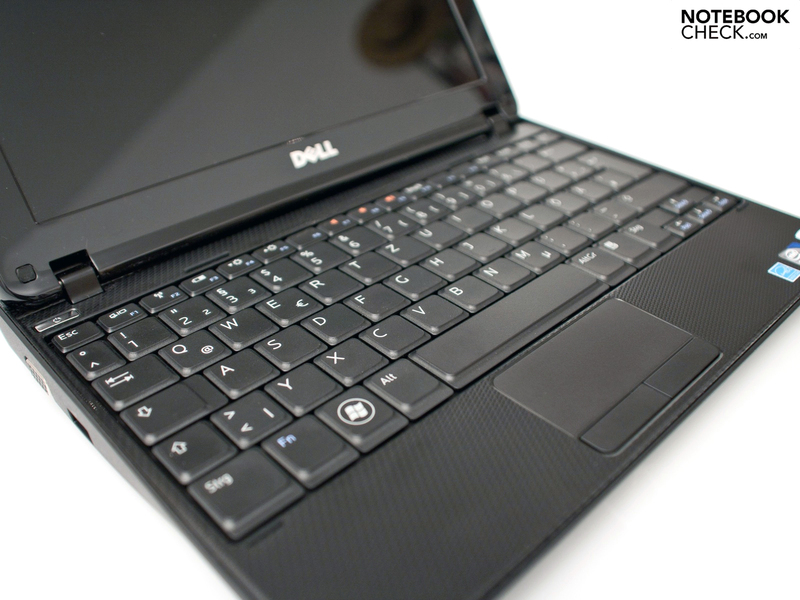 Review: Dell Inspiron Mini 1018 Netbook - based on the Inspiron Mini 1012. 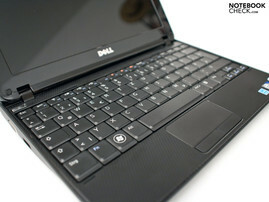 Based on the top-level model Inspiron Mini 1012, the new Notebook from Dell has several improvements but with reductions in almost all areas, however. 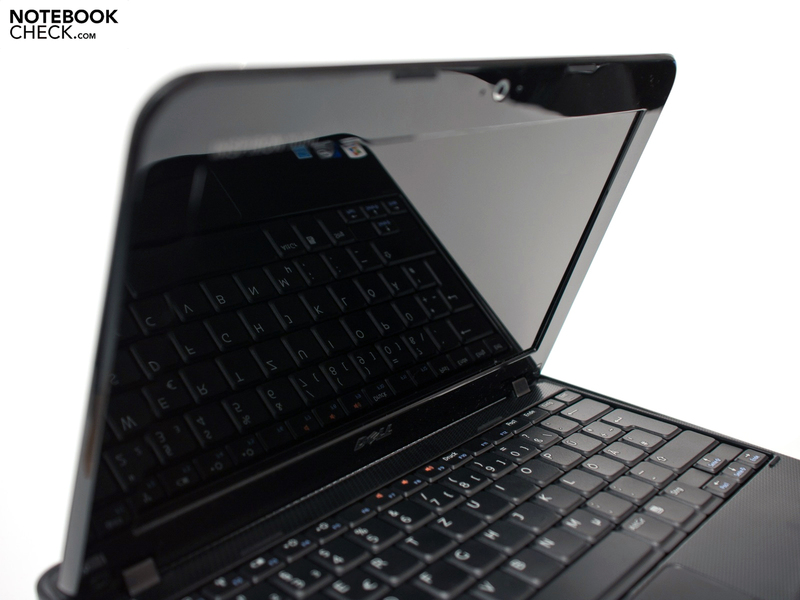 New features include the two separated touchpad keys, which greatly facilitate use of the netbook, and the current Intel Atom N455 netbook processor (1.66 GHz, Single-Core) with DDR3 support. 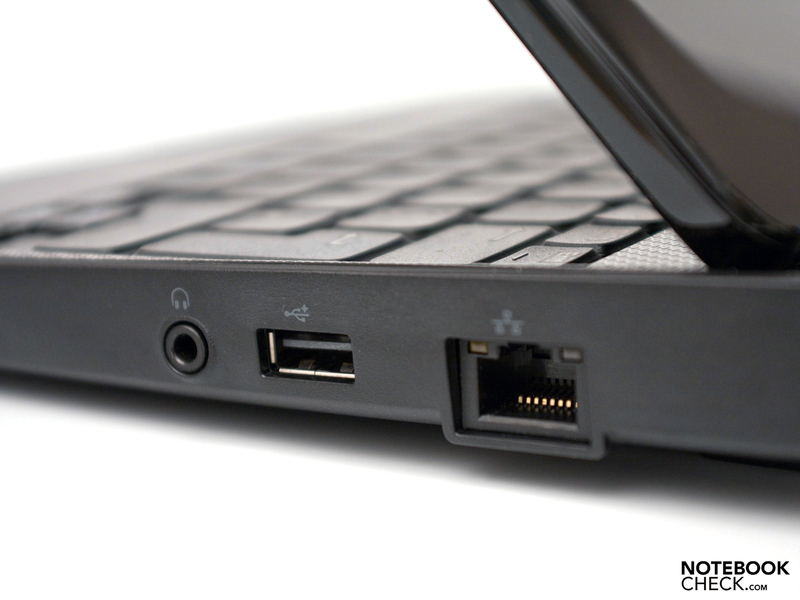 In comparison to the Mini 1012, Dell has reduced the number of USB ports to two. This simple netbook doesn't come with any bells and whistles but stands the test of everyday use. The Mini 1018 takes on its big brother's design of a wedge-shaped case. And now some details about the 1018's features: the current Intel Atom N455 Processor forms the CPU, which supports DDR3 RAM (1 GB DDR3-10600S-RAM). Additionally, the netbook comes with your choice of a 160 or 250 GB hard disk and the usual Windows 7 Starter (32 Bit) from Microsoft. The entry-level price for the Dell Inspiron Mini 1018 is 279 Euro (RRP, 160 GB HDD), whereas the top-level model with a 250 GB hard disk can be purchased at 349 Euro (RRP). The netbook comes only in black. The case design of the Inspiron Mini 1018 remains unchanged from the more expensive Dell Inspiron Mini 1012. Particularly eye-catching are the wedge-shaped design and the screen hinges that aren't placed at the very back of the case but rather bit closer to the user, letting the bottom half of the case jut out a bit toward the back. The netbook has a solid build in addition to a pleasant look and feel. The simple color scheme for the 1018 is new, which - opposed to the 1012 - comes only in black: The glossy display lid and screen frame are supplemented well by the matt underside of the case and the ripple pattern around the keyboard and touchpad. Unfortunately, the choice of the approximately 130 display covers in various colors and patterns available for its big brother, the Mini 1012, is not available in Dell's online store for the new Mini 1018. 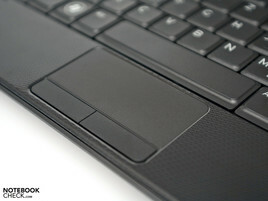 You can find further details about the case of the Dell Inspiron Mini 1012 in our extensive review. Dell has reduced the variety of ports to only the most necessary inputs and outputs. Compared to the Mini 1012, this netbook currently comes with only two USB 2.0 ports despite there being enough space for a third. The microphone input was also removed. 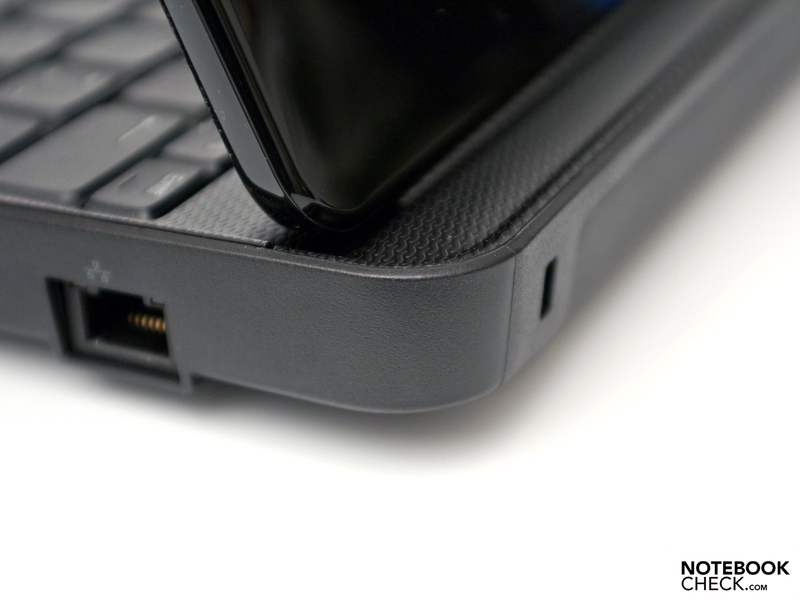 The headphone jack on the right side allows the netbook to be hooked up to an external stereo system but not to a headset since the netbook lacks the necessary combination port. Nevertheless, an analog microphone is built in with the webcam for recording or transmitting audio signals via Skype, for example. 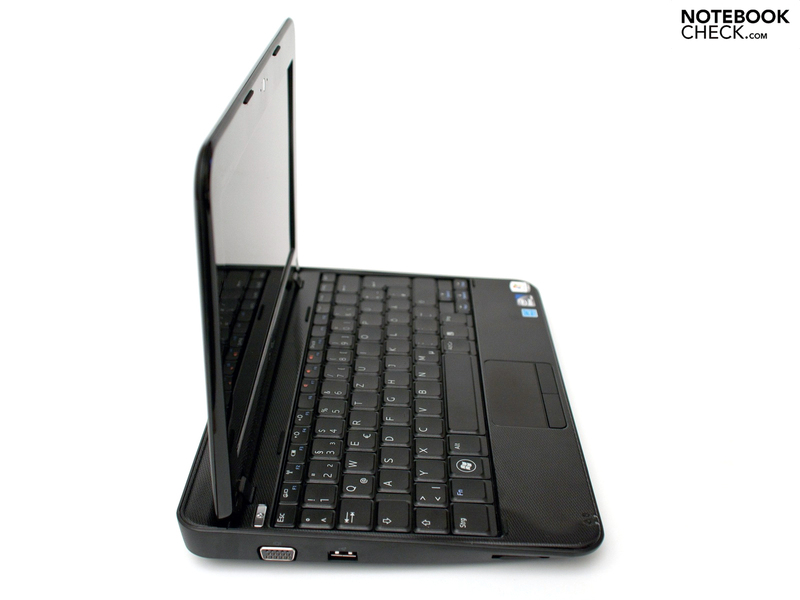 Despite the cuts in USB and audio, the netbook comes with several other ports: an analog video output (VGA), a Kensington Lock Slot, an RJ45 Ethernet port as well as a 3-in-1 cardreader, which can both read and write SD (SDHC), MMC and MS (MS PRO). Altogether, there are enough ports for typical use, though an additional USB port can sometimes be very useful. A USB 2.0 Hub is recommended for those needing more USB inputs. The ports are well distributed around the perimeter of the case due to the reduction in inputs and the fact that there is no exhaust fan. Mobility is a key issue and Dell doesn't hold out on much in this area. The Mini 1018 doesn't have the standard Gigabit Ethernet connection but instead uses a Realtek PCIe FE Family-Controller (10/100). On top of that the netbook has a 802.11n WLAN connection (Realtek RTL8188CE) as well as Bluetooth 3.0. The new Bluetooth standard can theoretically transfer up to 24 MBit per second and is therefore noticeably faster than Bluetooth 2.1 + EDR (max. 2.1 MBit per second). Dell does not include a UMTS module, but you can easily fall back on using a USB dongle for mobile internet access. Considering the price of around 300 Euro the standard package is quite modest. 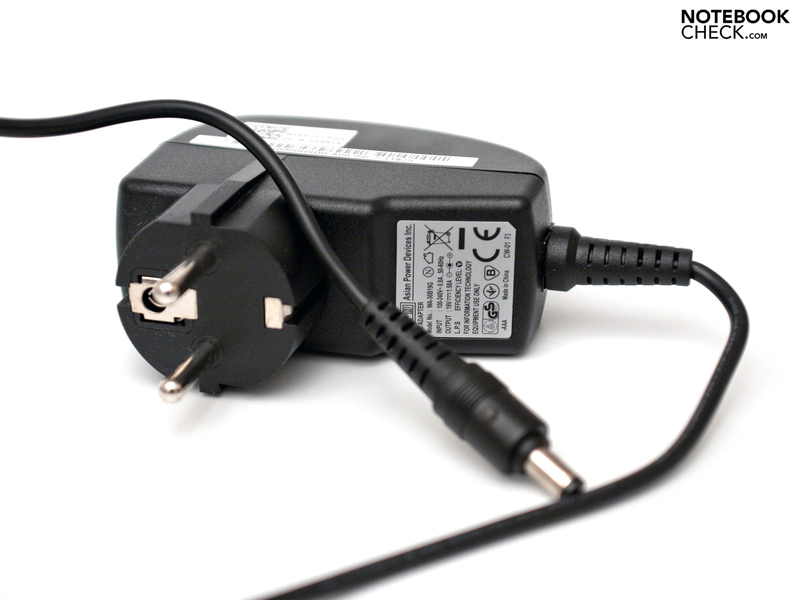 Besides the Netbook itself, a power supply for European outlets is provided (CEE 7/4 aka "Type F") as well as various manuals and a DVD with drivers and applications. Additional accessories can be purchased at Dell's online store at an extra cost. Luckily the keyboard layout of the Dell Inspiron Mini 1012 was adopted for this model. 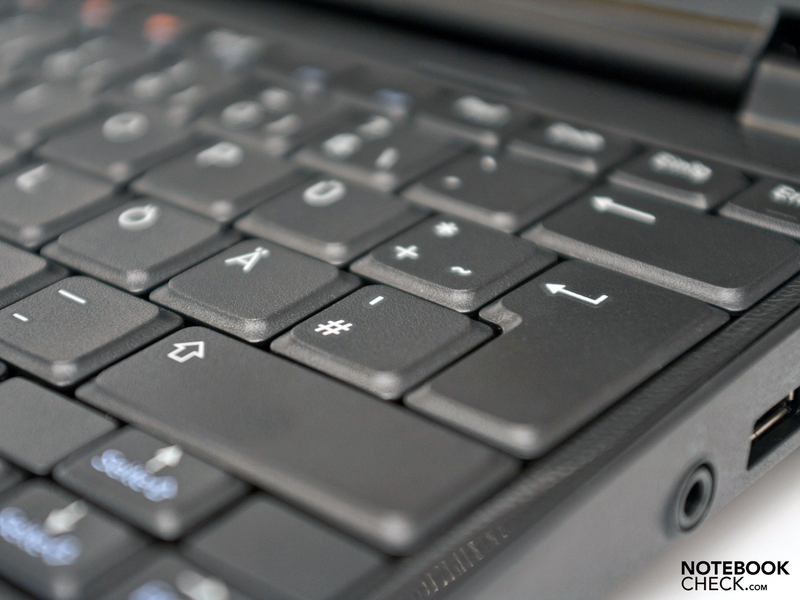 The netbook has a raised keyboard, where keystrokes are clean and crisp (not too soft). The keys also have a pleasant shape and feel. Keyboard shortcut aficionados will appreciate the fact that a full 92 percent of the keys found on a notebook keyboard also appear on this model. All in all, this is a suitable keyboard for those who spend a lot of time typing. The touchpad of the Mini 1018 is made available by Synaptics and has hardly changed in comparison to its forerunner, the 1012. Its variety of settings are more than enough for typical users. The surface has a slightly rough texture and is very comfortable. Moving the cursor is easy, although the small area can be irritating. The area comprises only 6.4 x 2.9 cm. Multi-Touch gestures are, unfortunately, not supported. 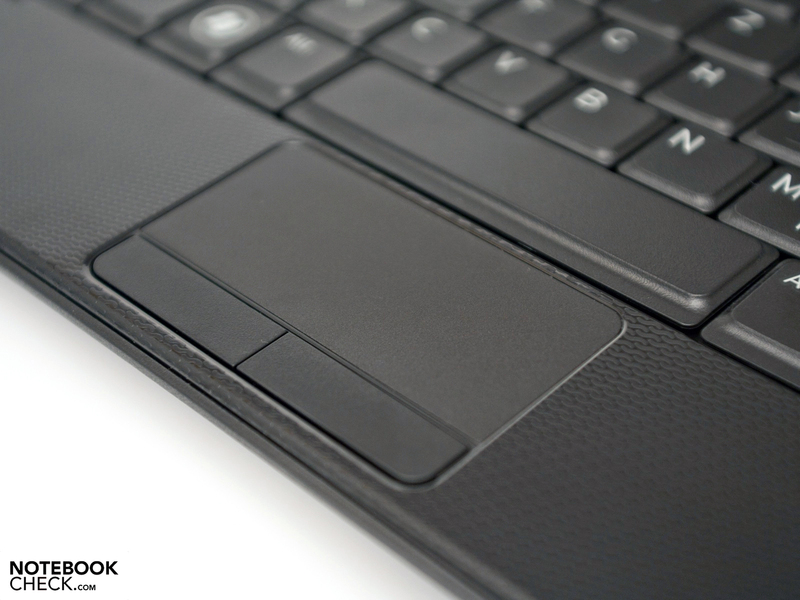 The touchpad keys are now separated, making the netbook easier to use. Perfect Keyboard for Those Who Type a Lot. Small Touchpad but with Separated Mouse Buttons. Dell has put in place a highly reflective 10.1-inch display (Typ: AUO30D2) with a native resolution of 1024 x 600 pixels. In comparison to an HD-ready screen (1366 x 768 pixels, 720p) this WSVGA resolution leaves less room for screen content, sometimes making horizontal scrolling necessary and decreasing productivity. The HD screen of the Dell Inspiron Mini 1012 is not offered and you have to make do with the lower-resolution version. The contrast ratio of 181:1 makes this display a below-average netbook screen. A reason for this is the elevated black level (1.32 cd/m²), which also dulls the rendering of black tones. Thanks to the glossy screen, though, colors appear very vivid and sharp. Watching movies in rooms with little ambient light can be quite enjoyable. The screen brightness comes to a maximum of 244 cd/m² (good for a netbook) with the average brightness being 220.8 cd/m². Finally, the brightness distribution amounts to 83 percent, making the screen brightness values fairly decent. The screen is evenly lit and no flickering can be detected with the naked eye. While the computer is turned on the screen can't be fully turned off, causing it to continually use up electricity. Although outdoor use in the park, on the train or in a café might not be very tempting when it's cold and gray outside, the Mini 1018's screen is well-suited for such times. The reflective screen can however be problematic. Working in closed-off rooms with little ambient light proves itself to be relatively problem-free, although some reflections may appear. Using the netbook outdoors when it's sunny greatly increases the reflectiveness of the screen, making it very difficult to see. The range of viewing angles is fairly good in the horizontal plane. The picture appears sharp and without any color distortion even at very sharp angles to the screen. You can read texts, watch movies and and look at photos with relatively no restrictions. Tilting the screen, however, quickly results in poor display quality. 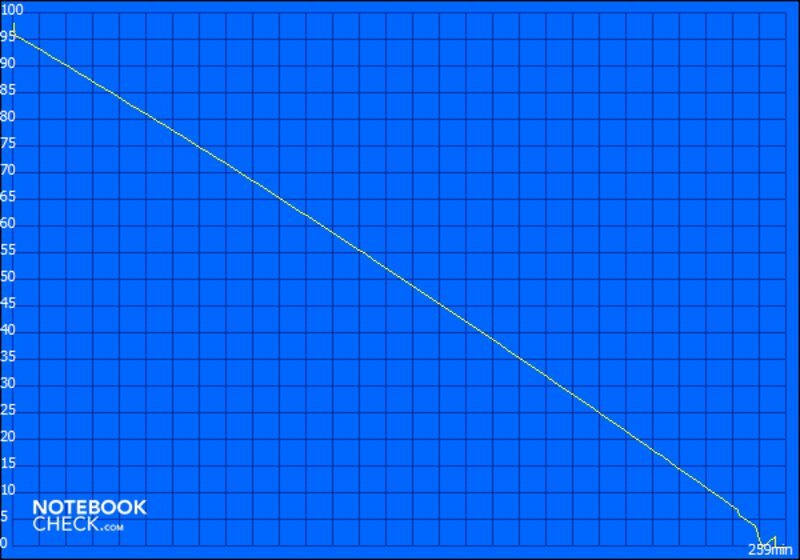 A tilt of 25 degrees away from the ideal position is enough to make the picture look like a negative. Nevertheless, colors do remain undistorted at much greater tilt angles. The Intel Atom N455 processor, which supports DDR3 RAM, has a clock rate of 1.66 GHz (single-core), and performs the same as the Intel Atom N450. 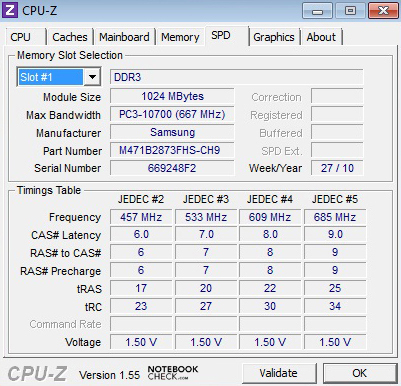 The DDR3 10600S RAM produced by Samsung works at a clock rate of 667 MHz. The full speed of 1333 MHz remains unused. 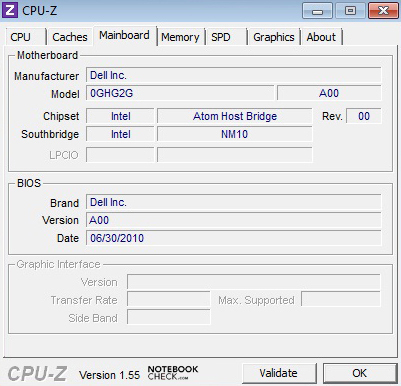 Special overclocking or power saving software is not offered by Dell, for which you'd have to rely on Windows 7 performance settings. Moreover, upgrading this hardware is made difficult by the lack of openings on the bottom of the case. In order to compare the performance of the Mini 1018, we tested it using various benchmarks. 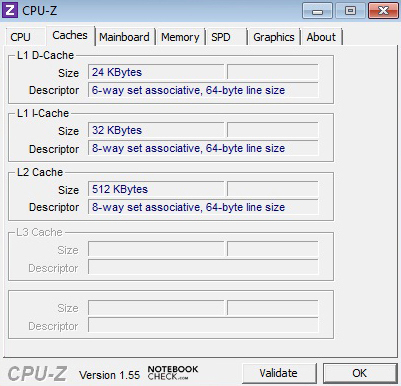 During these tests the high performance settings for Windows 7 Starter (32 Bit) were activated while all power saving settings were turned off. 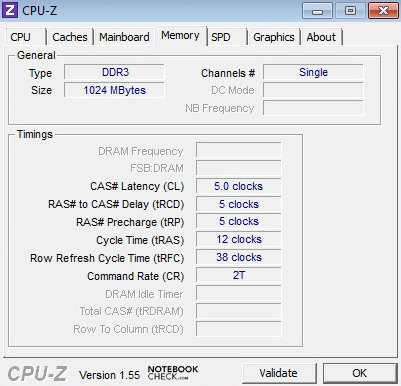 The clock rate was not raised, remaining at 1.66 GHz in the single core. The new processor and DDR3 RAM, sadly, did not increase application performance of the Mini 1018. 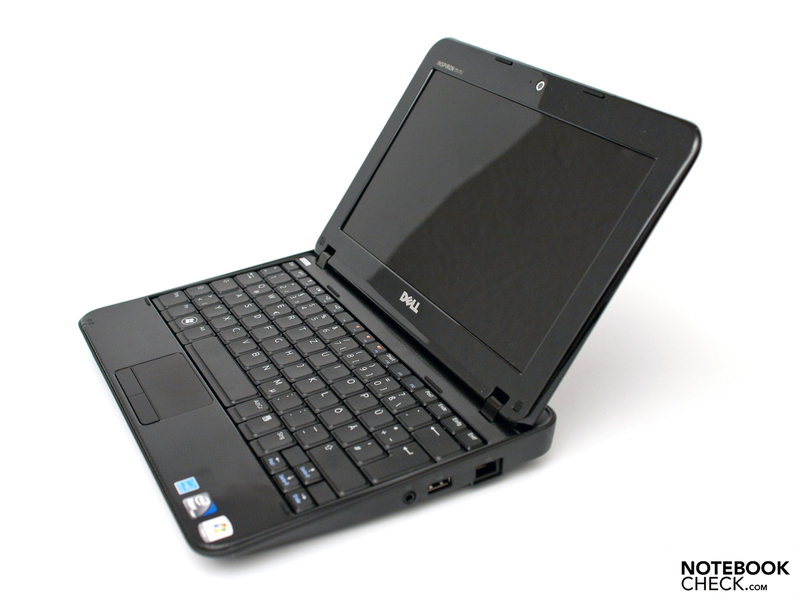 In comparison to its big brother, the Dell Inspiron Mini 1012, this netbook exhibits no clear difference in performance, which can be considered to be at the same level. Users will notice that the Mini 1018's performance is not up to par. The combination of Windows 7 Starter and the insufficient 1 GB of RAM seem to overwhelm the netbook, evidenced by how windows opening up and loading times are too slow and contribute to a choppy performance. All in all, values dealing with application performance fall within the usual range. 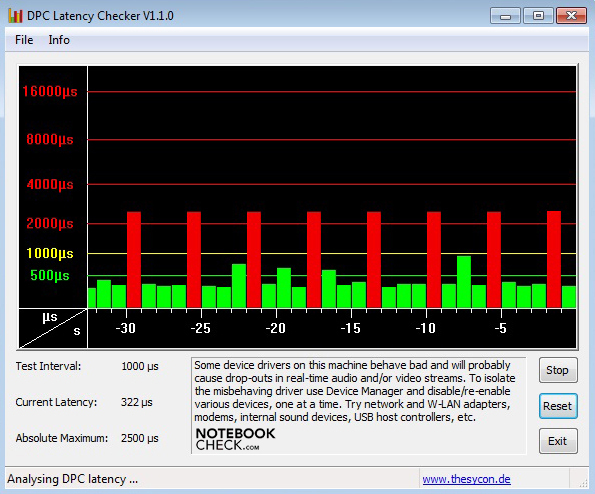 Only the DPC Latency Checker shows clear deviations from the norm and caused us some concern. Values over 1000 µs raise a red flag and can cause problems with the synchronization with peripheral devices. A familiar problem is a sort of crackling or popping sound from external sound cards. Our gaming benchmarks show the 3D performance of the Mini 1018 to be insufficient. 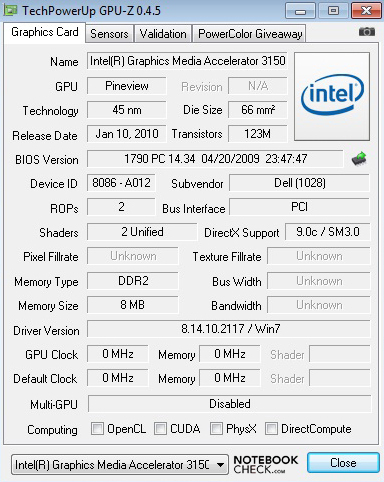 At a clock rate of only 200 MHz, the Intel GMA 3150 has limited processing power even for older games. Notebook users with bold gaming ambitions should wait for the more powerful Nvidia ION 2 GPU and the new Intel Atom N550 processor (1.5 GHz, dual-core), another alternative being an 11.6" subnotebook with a dedicated graphics card. 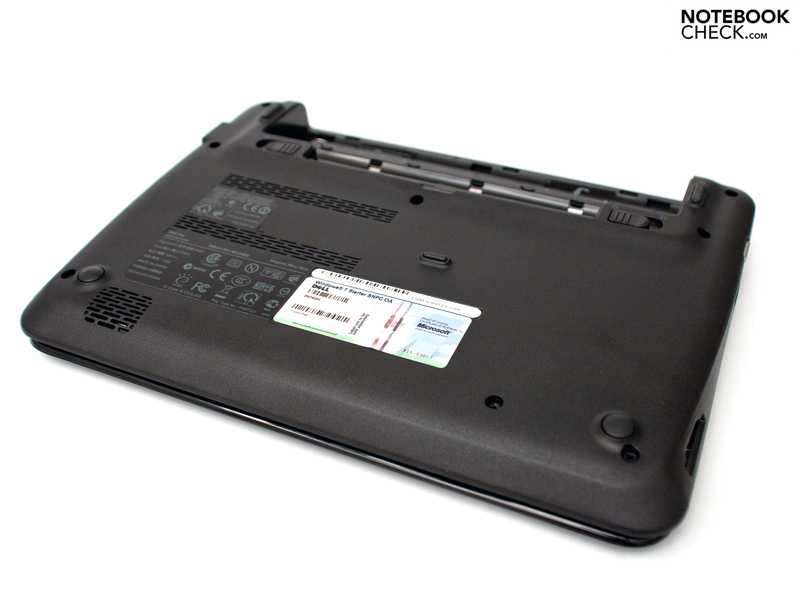 The netbook comes with one of two hard disks, 160 GB or 250 GB net capacity. Our test model from Hitachi (HTS545025B9A300) contains 250 GB of storage space. With a maximum transfer rate of 86.8 MB per second and a Burst Rate of 156.9 MB per second, it ranks in above average among 2.5-inch hard disks for netbooks. Replacing the hard drive doesn't come easy, though, since there's no opening at the bottom of the case through which to access it. In order to gain deeper insight into the gaming capability of the Intel GMA 3150 graphics card, we tested seven games. Among them were classics from 2004 as well as newer releases from 2008. The results were not surprisingly less than impressive. TrackMania Nations Forever can be played at 12.9 fps, but at that rate it's not too much fun. The lowest graphics settings allow for halfway smooth play, but it's hard to really enjoy. The more powerful Dell Inspiron Mini 1012 with a dedicated AMD graphics card shows a clearly better performance (77.6 fps, low, TrackMania) but even this netbook is not the best device for gaming. HD video playback is also limited due to the lack of a Broadcom Crystal HD Decoder. Only locally stored videos runs smoothly in 720p, and you might as well not even think of playing videos in 1080p. On Youtube and other websites, videos in 720p or 1080p do not run smoothly, forcing you to turn back the settings to 480p. 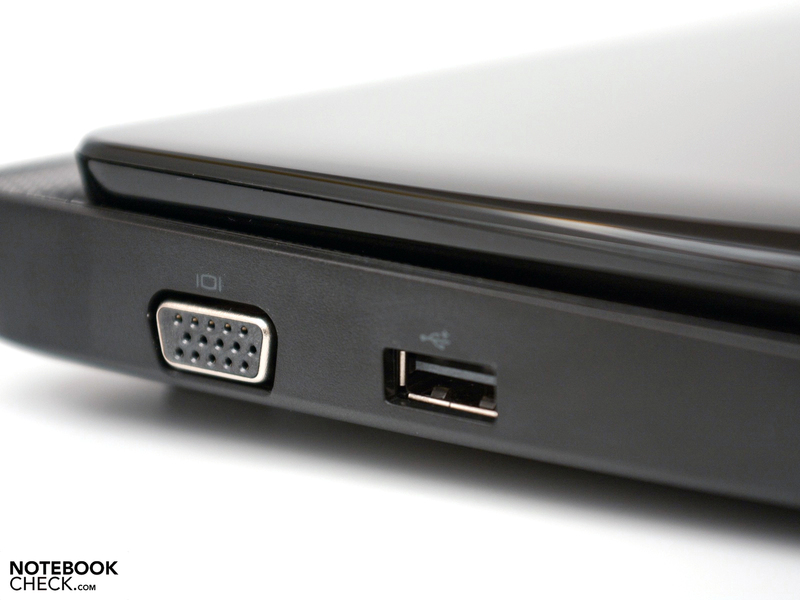 The Dell Inspiron Mini 1012 is a better bet for good HD video playback thanks to an optional HD Decoder. 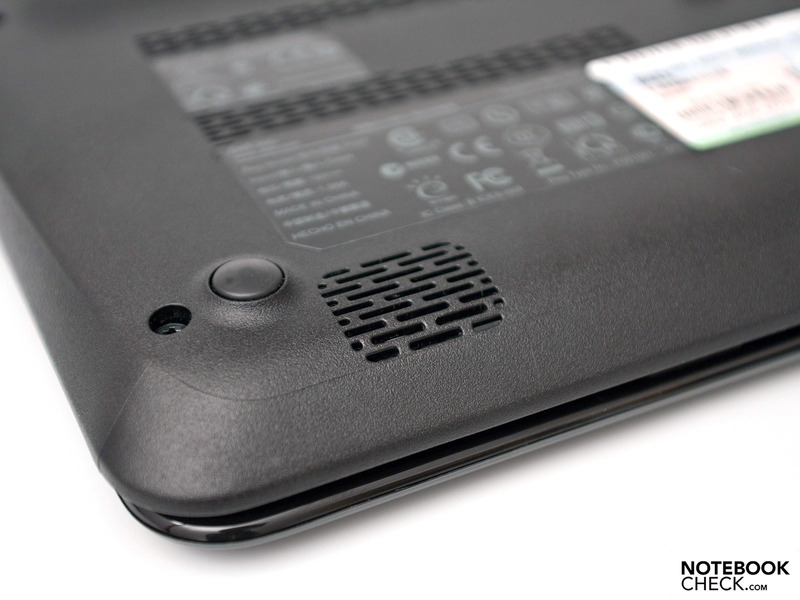 A key feature of the Inspiron Mini 1012 is the fanless cooling system. The hardware temperature is maintained by a cooling body made of copper. Air is fed in through the bottom of the case since there's no vent on either side. Thanks to this concept, noise levels stay within the good to very good range. Under normal use as well as heavy use, the level remains constant at 28.8 dB(A). This value is very low and only noise emanating from the hard disk is audible. The hard disk itself produces 29.7 dB(A) and can be irritating due to a continual but weak vibration. 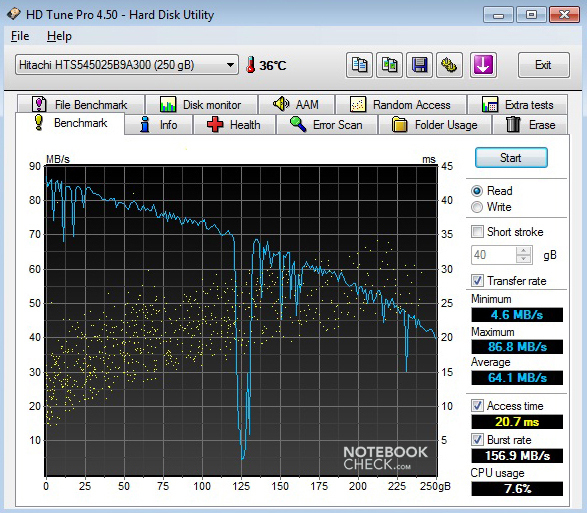 A modern Solid State Drive (SSD) would completely muffle this noise. Due to the fanless cooling concept, a higher temperature of the hardware is inevitable. Most notably, the temperature of the processor rises and warm spots can be felt on the outside of the case. Under normal use the maximum temperature is 39.8 degrees Celsius. The palm rest is - at a maximum of 29.8 degrees - a bit warm but doesn't compromise comfort. Under heavy use the maximum temperature of the bottom of the cases increases to 46.5 degrees Celcius. The corresponding rise in heat is easy to feel, in light of which the cooling system of the Inspiron Mini 1018 is hardly better suited for heavy use than the Inspiron Mini 1012 (the temperature reaching a maximum of 51.6 degrees Celsius in that model). All in all, the temperature values are slightly high, so that keeping the netbook on your lap over a long period of time - say on a train or outdoors - can become uncomfortable. 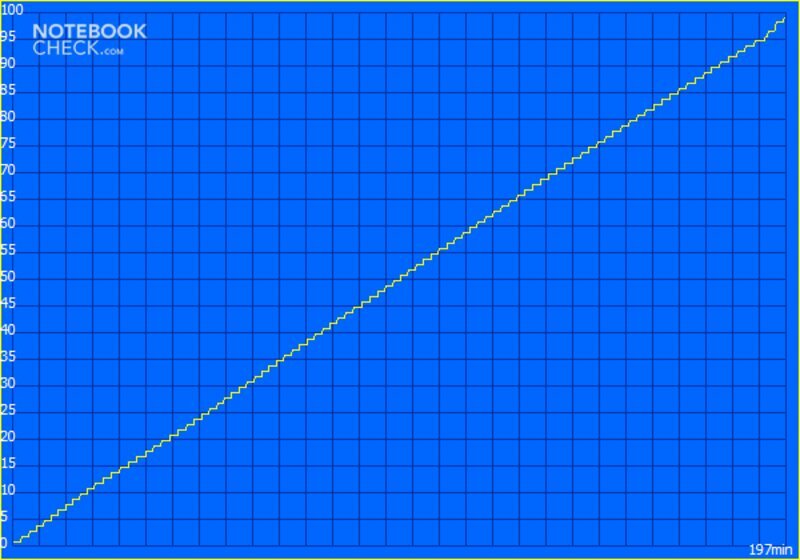 (±) The average temperature for the upper side under maximal load is 34.2 °C / 94 F, compared to the average of 29.8 °C / 86 F for the devices in the class Netbook. (+) The maximum temperature on the upper side is 39.7 °C / 103 F, compared to the average of 33 °C / 91 F, ranging from 21.6 to 53.2 °C for the class Netbook. (±) In idle usage, the average temperature for the upper side is 32.2 °C / 90 F, compared to the device average of 29.8 °C / 86 F.
(±) The average temperature of the palmrest area of similar devices was 29.3 °C / 84.7 F (-1.8 °C / -3.3 F). 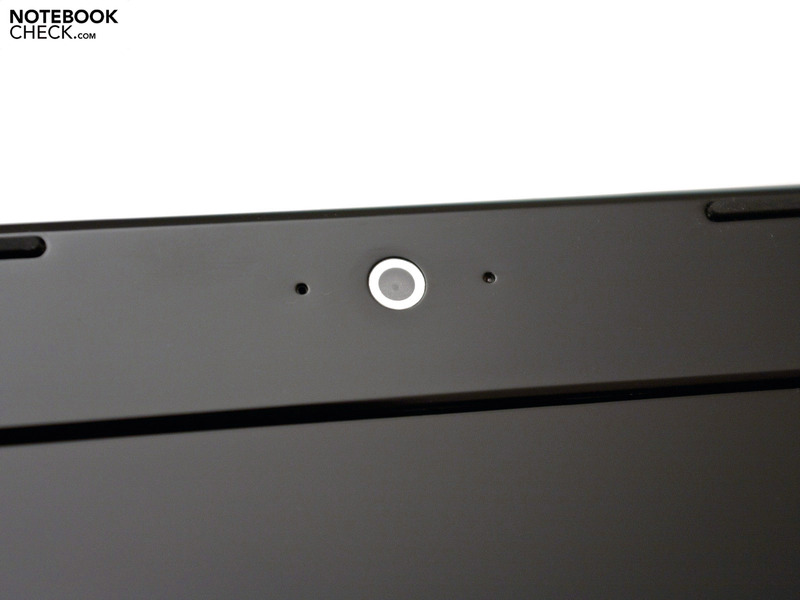 The Dell Inspiron Mini 1018 has only one speaker, which is located in the wedge on the bottom left of the case. The speaker surprisingly produces relatively good sound. The high notes are still enjoyable even at full volume and the bass notes are marginally audible. This mini soundsystem can't quite muster real, powerful bass. Unfortunately, sound coming from the single speaker feels very unbalanced when you sit in front of the netbook. An external stereo system can be hooked up through the built-in headphone jack. The sound quality through this jack is decent but some static can be heard. 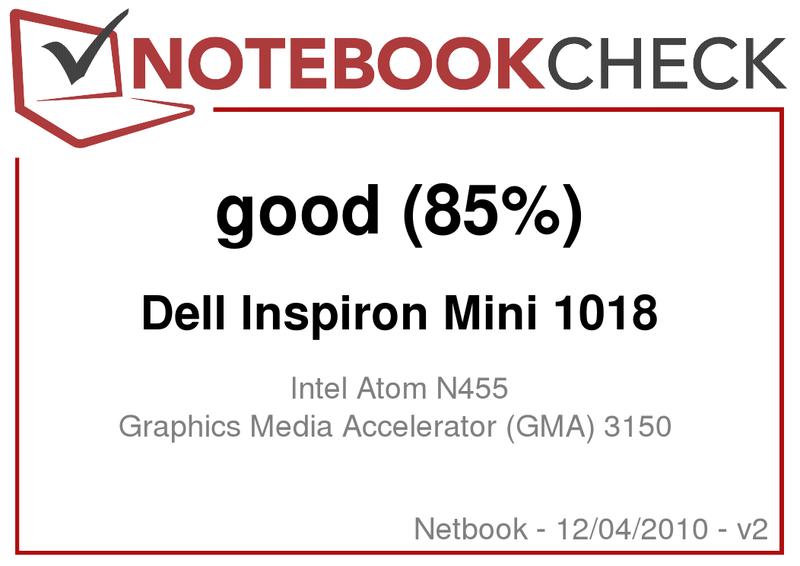 The new Intel Atom N455 in the Dell Inspiron Mini 1018 runs at 1.66 GHz in a single core, which compared to the Intel Atom N450 doesn't really use up more energy. The supported DDR3 RAM doesn't make itself particularly noticeable in terms of power consumption which remains at about the same level. The consumption of 5.5 to 10.2 watts under normal use stays within the normal range for this hardware configuration. When the netbook is turned off or in standby, the 0.2 watts used is perfectly within reason and leaves no room for negative commentary. The "Classic Test" of the "Battery Eater" tool simulates use under maximum strain by means of a simple Open GL operation. For this, the highest performance settings for Windows 7 are chosen as well as maximum display brightness and the wi-fi is activated. This configuration results in maximum strain on the battery, resulting in a battery life of 4 hours and 19 minutes. If you just want to surf the web a bit with moderate display brightness, a good 7 hours and 44 minutes will pass before exhausting the battery. This battery life should usually be enough for an entire work day. At the lowest possible strain, the "Reader's Test" shows the maximum possible battery life rising once more to a very fair 10 hours and 27 minutes. It's to be noted, however, that during this test the Wi-Fi was deactivated and the lowest display brightness selected. 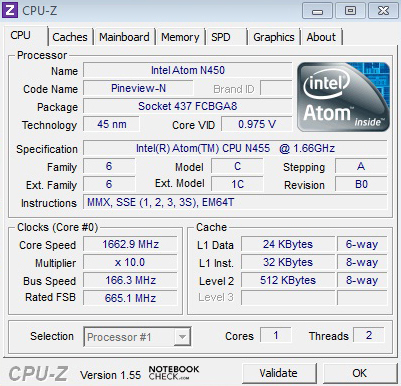 On top of that, Windows 7 downsamples the Intel Atom N455 to a meager 1.0 to 1.3 GHz, resulting in slower performance. All things considered, the lifespan of the 6-cell battery with 48 watt-hours is quite good. 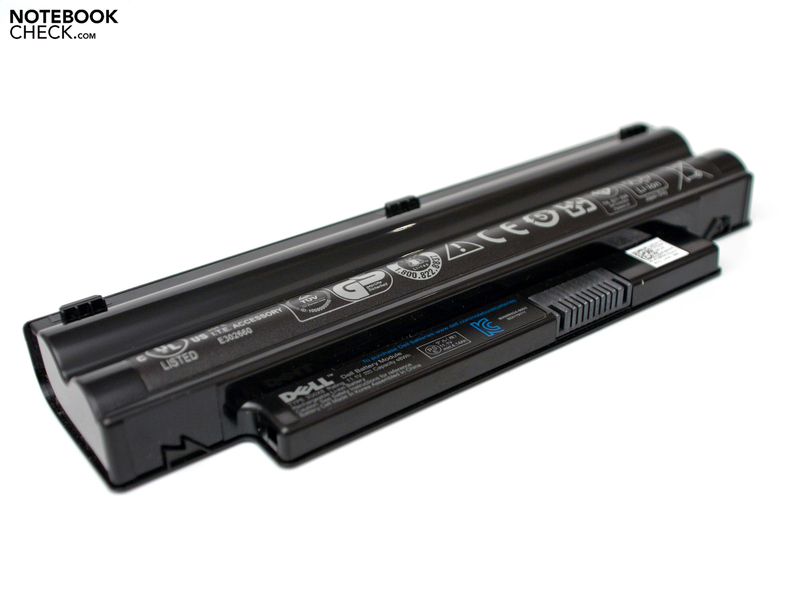 Dell does not offer a larger battery. The new Dell Inspiron Mini 1018 is appealing in many ways but prospective buyers should also take notice of several disadvantages. The case and sturdy build of the Mini 1012 are familiar, whose quality and unique design can be quite attractive. The amount of ports was sadly reduced: the third USB port and the microphone input were removed. 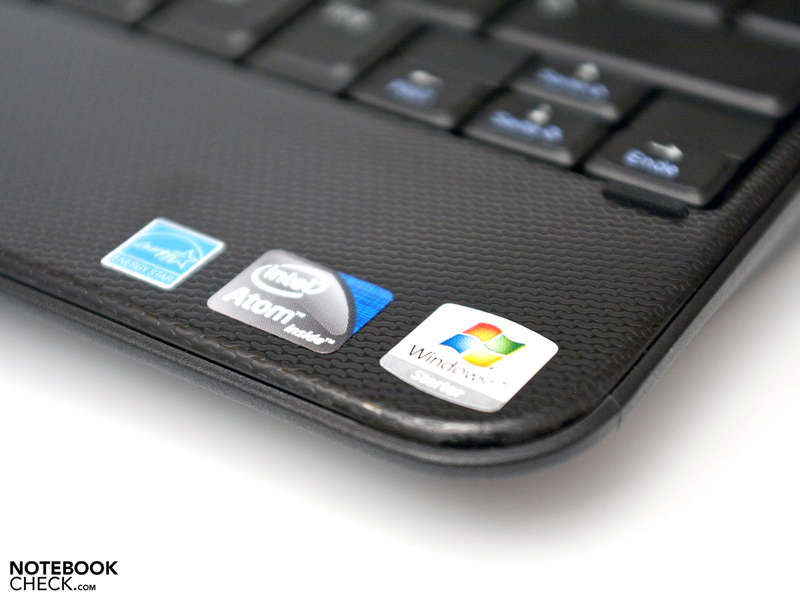 The Mini 1018's performance levels are typical for a netbook and fully sufficient for everyday office work. Applications in the way of video editing and games should be avoided because this netbook's simply not built for them. The display is quite good, ranking well in our tests, but the reflective screen can lead to problems every now and then. Positive aspects include the fanless cooling system and long battery life. The interesting concept in cooling and the large 6-cell battery are good selling points. All things considered, you get an inexpensive entry-level netbook with a tried and true build and average performance levels. 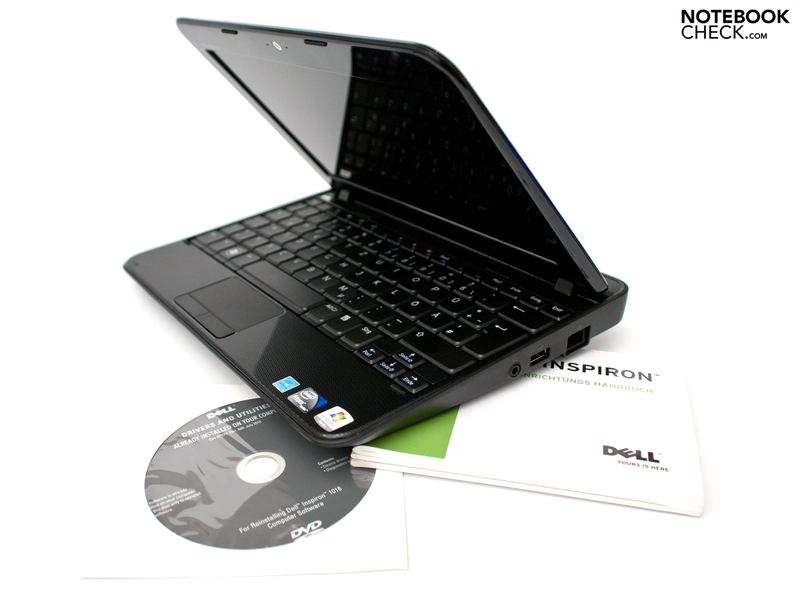 The Dell Inspirion Mini 1018 can be purchased directly from Dell starting at 279 Euro (RRP). 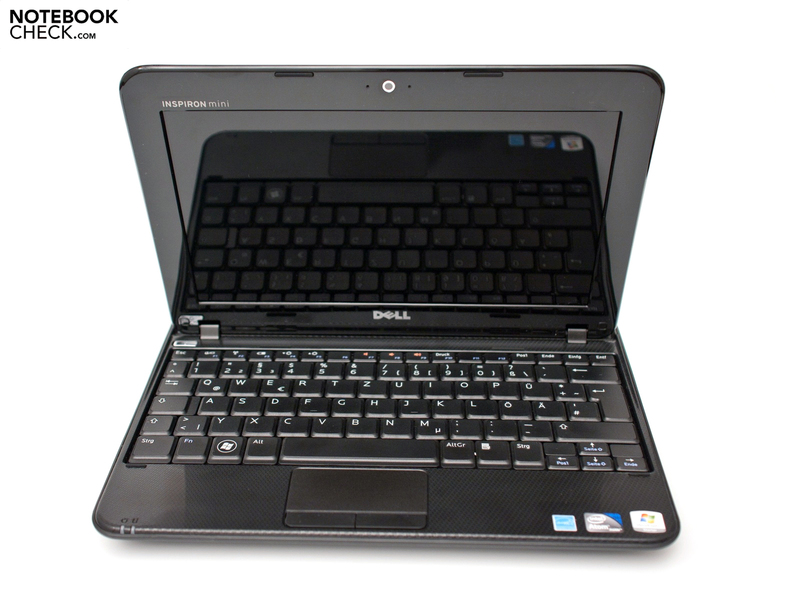 Higher expectations can be met by the Dell Inspiron Mini 1012, which will go on to be considered this netbook's premium model. 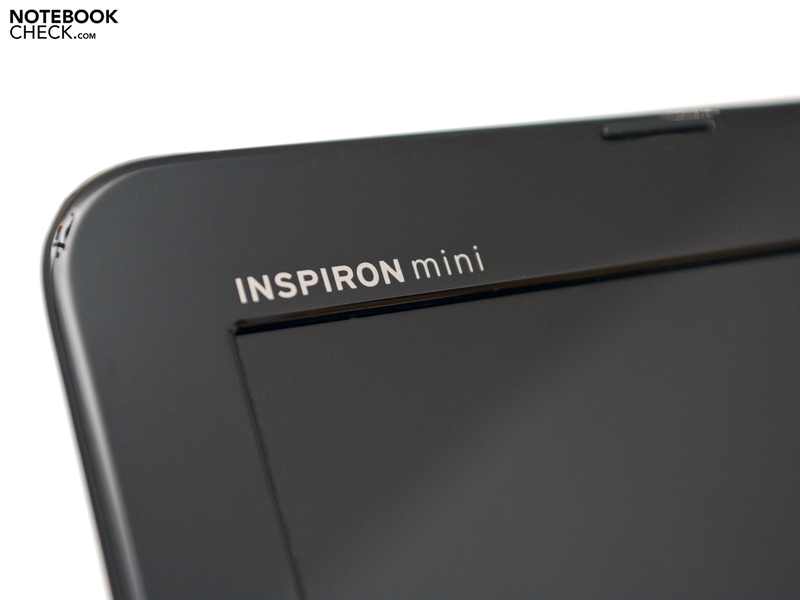 The Dell Inspiron Mini 1018 is only available in black. The large 6-cell battery (48 Wh) can last over 10 hours. The single speaker produces rather unbalanced sound. The bottom of the case is simple and plain, contributed to by the fanless design. The 0.3 megepixel webcam and internal microphone allow for video conferencing. The series name is inscribed above the screen. The new Intel Atom N455 supports DDR3 RAM. Application performance is not up to par. The keyboard is comfortable enough to type away at for hours. A third USB 2.0 port would have been nice. The position of the screen hinges takes some getting used to. 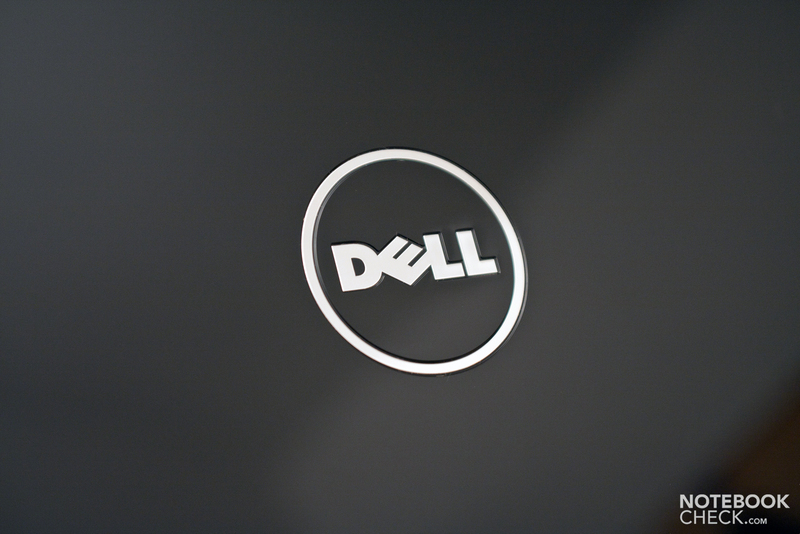 Look for the shiny Dell logo on the display lid. ... due to its compact build. Same time-tested design as the Dell Inspiron Mini 1012. The power supply is very compact, weighing a mere 200 grams. The long battery life, the case design, the sturdy build, and the starting price of 279 Euro (RRP). 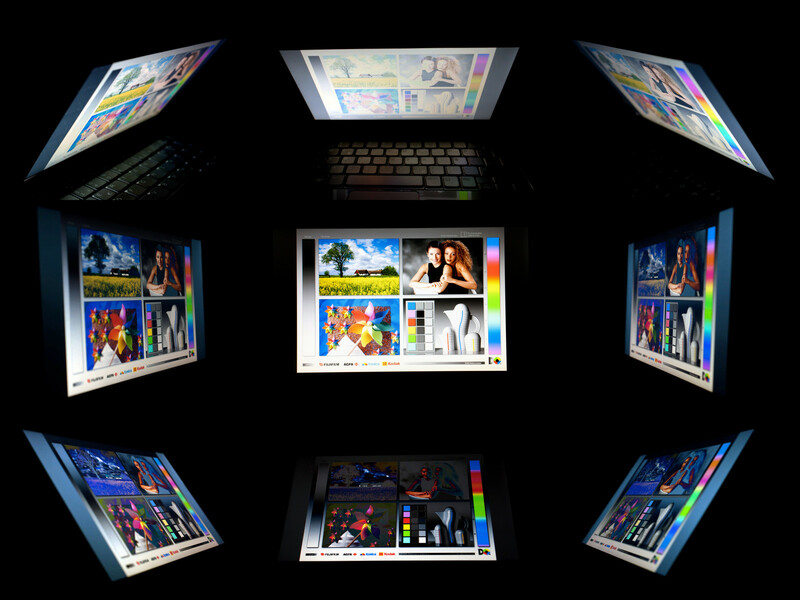 A matt screen that can render higher resolution video as well as a larger touchpad. How quickly a few reductions in the number of ports and case colors could yield an otherwise structurally identical "budget version" of the Mini 1012. The Asus Eee PC R101 with a top-quality screen for 249 Euro is arguably the toughest comepetior. The Lenovo IdeaPad S10-3 with a sleek design for 400 Euro. 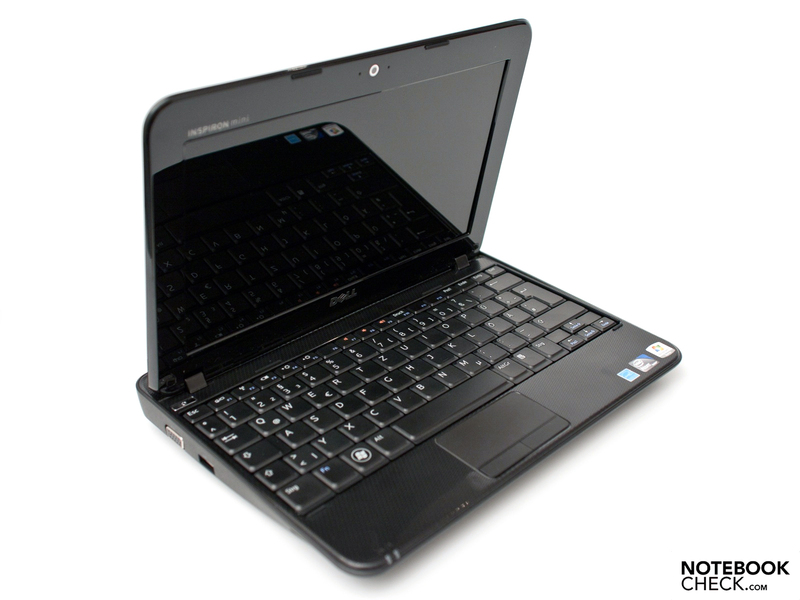 The Acer Aspire One 533 Netbook with an Atom N455 for 329 Euro und the Asus Eee PC 1015P with a suitable-for-business case design also for 329 Euro.